In the warm spring sunshine, plum and nut trees burst into blossom and the grass grows long and lush in verdant green meadows. A striking lime green woodpecker with a crimson head searches for ants. He potters, undisturbed across the lawn. Fifty -four hectares of beautiful park land are criss-crossed by paths, running on compass lines. Geometrically ordered in the style of a French garden, there are also 400 different types of trees, dotted all over, in the haphazard English style. One-hundred year old chestnut avenues offer a silent haven and the crisp April morning becomes suddenly cold and dark. A Transylvanian long-eared owl awakes from his doze in the branches overhead and directs one eye at the people below, dressed in black and moving slowly in procession. We are only 600 meters away from the polluted bustle of Budapest's Keleti station but we could be on the other side of the world. Kerepesi cemetery is a nature reserve, a botanical garden and a history museum - the perfect place to escape for a moment of peace and reflection when the city hysteria becomes overwhelming. In 1841, Count István Széchenyi decided that there should be a Hungarian national pantheon. Eight years later, burial began in Kerepesi. Until then several smaller cemeteries had been used to bury the dead. In 1885, it was declared a decorative cemetery and Rákoskeresztúr public cemetery was opened to relieve the burden. Antal Sinka is now retired, but worked for many years as a guide and knows the stories behind every grave. Acrid smoke comes from Fiumei út over the high surrounding wall. We go down into a crypt while a stone mason examines the damage. Images spring to mind of spirits lurking in the shadows or vampires waiting to pounce, but in broad daylight no self-respecting vampire would leap forth, only three stone sarcophagi sit in a state of dust and decay. Grave robbers, like pollution, continually threaten the tombs. Sinka says, "Lajos Batthány was executed in the revolution in 1849 with three bullets. His body was hidden in the church on Rákóczi út and he could not rest in peace until 1867. He was disturbed again in 1993, when grave robbers stole his Ft 22 million sword. They overlooked his wife's Ft 11 million earrings, which have now been placed in the National Museum for safekeeping." This cemetery has witnessed many funerals of historic importance. On 6 October 1956, the reburial of László Rajk took place. Rajk (1909 -1949) was an underground communist leader in the 1930's who fought in the Spanish Civil war. After World War II he was Hungary's Minister of the Interior, and later foreign minister. Falsely accused of "Titoism," he was arrested and executed in 1949, becoming the most famous victim of the Hungarian purges. In the thaw that followed Stalin's death, he was posthumously rehabilitated and re-interred in Kerepesi cemetery. The reburial became a mass demonstration, giving a hint of the Uprising which would break out 17 days later. The most recent major burial in Kerepesi was that of Democratic Forum (MDF) Prime Minister József Antal who died in office in 1993. His funeral took place on a bitterly cold Saturday evening in December 1993, thousands holding candles and singing mournful hymns in the floodlit dusk. The grave looks different now, alone in the middle of a bright, sunny meadow. A modest wooden cross, covered in flower tributes, contrasts with the resting place nearby of a statesman of another time, Ferenc Deák, honored by an ostentatious mausoleum. The greatest statesman, Lajos Kossuth (1802-1894) has an immense mausoleum currently being restored. Fenced off, the bronze statues of Genius, the Hungarian crest and several white marble lions by the architect and designer Alajos Strobl sit in the grass, instead of on the roof. Situated in a corner, away from the statesmen and nobility is the workers' pantheon, designed by József Körner in 1958, and fast becoming a museum piece. It is one of the few places in Budapest where you can see the word "Communism" written out in bold letters. The slogan "A KOMMUNIZMUSÉRT A NÉPÉRT ÉLTEK" (They lived for Communism and for the people") dominates the spacious white stone piazza. Giant statues of two young men and a woman holding hands in Socialist Realist style gaze out boldly into the future. Six massive white blocks of stone bear reliefs of workers in the field or at war, and remembrance plaques testify to the bravery of socialist workers. The cavernous two-level crypt underneath can be visited if the unpredictable attendants are on duty. Here, the ashes of politicians and artists find eternal peace. Leo Frankel, Gyula Derkovits and Ferenc Rózsa are just some of many names, recognizable from Budapest street names. Black ceramic urns stand on shelves carved from Austrian red limestone. One of the urns contains the ashes of a certain Éva Braun. Sinka says, "It was often pointed out to visiting officials to test if they were paying attention. She really lived and, ironically, was a young Jewish member of the partisans. The name and dates, 1917-1945 are identical to Hitler's mistress." Behind the Worker's Pantheon is a plot for the heroes of the 1956 uprising. The plot for the "upholders of the system" in 1956 - the secret police or ÁVO - is also in Kerepesi, but Sinka explains, "The two groups were buried on opposite sides because if there was a memorial service for both groups on the same day, there would be fights." In the workers' movement plot, crimson rose bushes grow on black marble tombs decorated with a gold star. Former Hungarian President János Kádár and his wife, Mária Tamáska, share a modest red marble gravestone in the middle. Kádár and Antal represented diametrically opposed political systems, but they both share equal amounts of floral tributes and are the two most visited graves in Kerepesi. Fossilized ammonites can be seen in the polished stone on Kádár's grave. Nearby are some unusual tombstones from the baroque period 1600-1700, featuring skulls and crossbones. Many of the stones have bullet holes where, "Our Russian brothers" as Sinka adds ironically, were taking pot shots from the steps of Deák's mausoleum, or trying to destroy landmarks to make it difficult for German troops to parachute in. Poet Endre Ady has what looks like a bandage around his arm but it is a stone plaster, covering a real bullet wound from a Russian gun. The Arcade is two walls of elaborate graves and statues bought for posterity by wealthy families. One such resident of this eternal avenue of Hungarian elite is the Gundel family, "The kocsma (pub) brothers," as Sinka calls them. At the four corners are stunning frescos on the ceilings, depicting Biblical scenes interwoven with Transylvanian -style buildings. Russian soldiers are fenced off in a separate plot. Those who died in 1945, "Saving Hungary from the German fascists," and those who were killed in 1956, "Saving our land from the attacking anti-revolution" as the plaques say. It is one of the few places in Budapest where you can still see a red star. Two tiny black wild kittens play on the graves, showing a healthy disrespect for death. Poet János Arany worked under an oak tree on Margit Island and wanted to be buried there, but the authorities forbade it. Instead, he lies on an island of grass. In 1886, the gardener Emil Fuchs planted two acorns from Margit Island next to Arany's grave. The writer Albert Pákh had a star above his name. This does not always mean a communist worker, Sinka says it also signifies the Hungarian symbol for death. Gyula Baghy, an Esperanto poet, has an "E" in a star on his headstone. The sculpture Géza Maroti (1875-1941) designed his own gravestone, which is unique in Hungary. A white marble slab depicts the back view of a naked woman, surrounded by lots of cavorting and canoodling folk and was considered very brazen at the time. The grave site is situated in the undergrowth, the untended wild land towards the top right-hand corner of the cemetery. The neighboring Jewish cemetery (entrance 600 meters down Salgótarjáni út) has some very old but impressive large tombs, it has suffered from neglect for many years and is currently undergoing restoration. It is not possible to enter, two giant black dogs as terrifying as Cerberus, guard the gates. People are warned against going down toward the wall dividing the main cemetery with the Jewish cemetery. In the top right hand corner the grave yard is overgrown, and neglected graves crumble. Dodgy types lurk in the bushes, so women would be best advised to avoid this part. The writer Mór Jókai (1825-1904) lies in a very simple grave, as he wished, surrounded by a circular colonnade, covered in ivy. On the inside of the ring, sculptures of doves sit as if in the rafters, and round the outside run Jókai's words, "The spirit within me goes with you, it will be there among you all, you will always find me among your flowers, when they wither, you will find me in the leaves, when they fall down, you will hear me in the evening peal of bells, when they die away and when you remember me, I will always be standing by you face to face." A pair of adult owls live in the tree nearby, keeping watch over the colony of poets. Endre Ady (1877-1919) has a simple stone in the shade of chestnut trees opposite Jókai. Actress Lujza Blaha (1850-1926) lies just across the way. A crowd of mourning cherubs and a balladeer surround her death bed. Mihály Károly, the first president of the Hungarian republic in 1918, is sheltered by a tent-like structure with incredible acoustics.. Like an open whispering gallery, you can send secret messages from one corner to the other. Sinka says, "Károly's daughter, an aged countess came to visit the grave but left in a huff, saying she would only return when all the cobwebs have been removed." Poet Attila József (1905-1937) lies in a modest grave with his mother and sister, not far from statesman Ferenc Deák's imposing mausoleum. The authorities said it was suicide, and Hungarian law states that a body must be buried in the same town or area as the death. However, the Kisfaludy Society saved money and brought the body to Budapest. 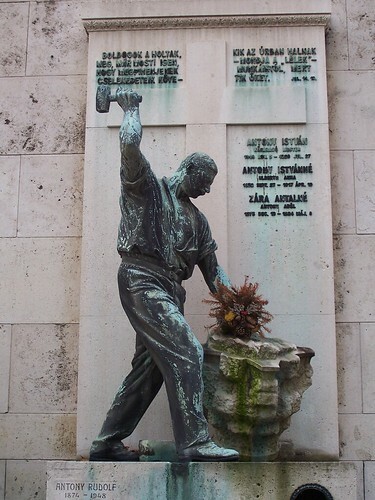 In 1955, József was first buried in the Workers' Pantheon section then moved to his present resting place, where a simple white stone marks what is, hopefully, the final resting place of Hungary's best-loved poets. Near the Russian memorial is the grave of teenager Mária Csizmarovits who died in the 1849 revolution. She disguised herself as a man to get into the army. 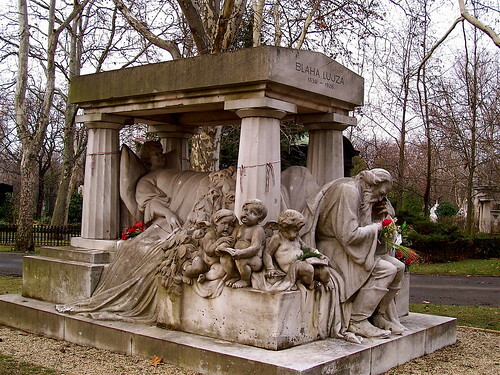 The prima donna Mari Jászai bought stone form the first Hungarian theater when it was demolished, to use as her grave stone. The theater stood on the corner of Múzeum körút and Rákóczi út where there is now a business center. Adam Clark, the Scottish supervisor of the Lánchíd construction is buried in a family tomb. He married the widow Aldasy from a German family. The wording on the tomb is in German. Nearby is a grave that just says "Léda" She was Adél Brüll, "Léda" in reverse, a married woman who was poet Ady's lover and muse. Their love affair was public knowledge and caused a scandal. When they split up in 1913, Ady wrote a famous farewell letter. She died of syphilis in 1934. The artists' plot is full of imaginative graves, pianos, theatrical masks and handwritten signatures. Writer Zsigmond Móricz is buried with one of his daughters, the other is about ten meters away. They quarreled and now remain forever not on speaking terms. Weeping willows hang over the grave of Vilma Hugonai who became the first female doctor in 1903. János Pásztor , a sculptor, used his wife as a model. You can see her likeness in statues on his and many other graves. She had a particularly beautiful naked figure with rounded buttocks. An important man was to be buried in the same plot, just behind, but his widow threw a tantrum, complaining that the grave could not face such a peach-like bum. She would not allow his body to share the same graveyard and he was moved to Rákoskeresztúr cemetery in the 17th district. Coming out of the main gates, you are hit by a blast of smoke and fumes from the lorries thundering along Fiumei út. It is quite a contrast from the quiet, cool green seclusion of the graveyard. Kerepesi is a peaceful sanctuary in the heart of the city and one of the best parks for walking and quiet contemplation in Budapest. It is a good place to spend an afternoon or maybe eternity.